Silver prices this week dipped below $19 for the first time in three months, but the factors suppressing price gains in this current bear session have just about run their course. There was further trouble in other silver investments. The iShares Silver Trust (NYSE Arca: SLV), the largest silver-backed exchange-traded fund (ETF), which holds physical silver bullion in London and New York vaults, was down 2.1% on the week, trading at $18.32 as of yesterday's close. The ETFS Silver Trust (NYSE Arca: SIVR), a close substitute to SLV, has fallen 2% on the week as well. 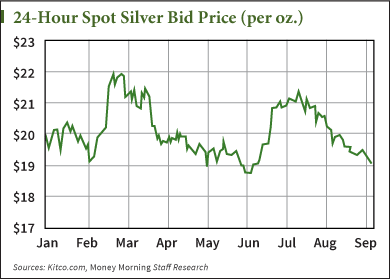 Even silver stocks weren't immune to the silver market's current malaise. Key silver mining companies saw their shares take a dive this week, with Pan American Silver Corp. (Nasdaq: PAAS) falling 6.4% and Silver Wheaton Corp. (NYSE: SLW) down 4.2%.